Scleral contact lenses are the newest lens designs meant specifically for patient with hard to fit eyes, keratoconus, post-corneal transplants, and severe dry eyes. The advantage of these lenses over other soft and ordinary rigid lenses are they provide excellent vision plus often a surprisingly comfortable fit even at the first visit. Dr. Fouad Melamed, at Melamed Eye Care, offers a wide range of contact lens options including scleral contact lenses for those patients who are require or interested in better vision and comfort. Scleral contact lenses are larger than conventional GP lenses and provide initial comfort similar to soft lenses. If you had trouble wearing contact lenses in the past, been told you are not a good candidate for contacts, or have a corneal condition such as keratoconus or had corneal transplant surgery — scleral contact lenses may be the solution you are looking for. They are called "scleral" lenses because these large gas permeable lenses vault over the entire corneal surface and rest on the "white" of the eye (the sclera). All our scleral lenses are made with highly breathable, rigid gas permeable lens materials. 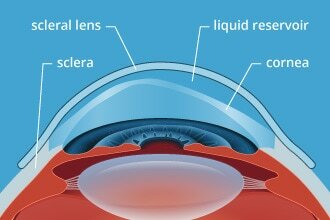 So though scleral lenses cover the entire cornea, plenty of oxygen reaches the front surface of the eye to keep it healthy and comfortable. Cost of Scleral lenses are custom-made to the exact specifications prescribed by your eye doctor to provide the best possible vision, eye health and comfort. And also usually take a few visits to fine tune to your eyes. ​For these reasons, professional fees associated with fitting scleral lenses and lens replacement costs are higher for scleral lenses than other contact lenses. In some cases, vision insurance may cover a portion of the costs associated with scleral lenses.